14 n PRECISION ENGINE n January 2015 PRECISION ENGINE Torque values alone are not adequate when performing assembly where opti- mal performance is required, and where exacting bolt/stud load must be accurately measured. Torque and torque/angle meth- ods can result in 25- to 30-percent load variations. Instead, the bolt/stud load is measured with an ultrasonic gauge. Simulating operating cylinder head load on bores while honing is the most criti- cal factor in minimizing bore distortion. Again, this means going beyond merely using a deck plate with bolts torqued to value. Actual bolt loads must be monitored and achieved at pre-determined levels. This information is provided merely as a means to help you understand what can be involved in minimizing bore distortion. For the average high-performance street or race engine, the cost involved in tak- ing matters to this extreme simply aren't practical. How Much is Enough? Minimum clamp load must be greater than the combination of lift-off force and required sealing force. A general approximation (a good gen- eral model) for clamp load is three-times that of lift-off force. This generally results in static sealing stress in the combustion area of 7,500 psi. Lift-off force for a 4.25-inch bore at 1,400 psi peak pressure is 19,861 pounds Depending on the application and number of bolts featured to seal each bore, indi- vidual bolt load requirements may be in the 6,165- to 11,917-pound range. For example, a typical ARP 7/16-inch stud may be rated at 12,700 to 15,600 pounds load range. Head Gasket Selection/Consideration Wire ring-style head gaskets may relax as much as 10-25 percent after initial assembly. By contrast, MLS gaskets relax less than 10 percent after initial assembly, thereby providing additional assurance of maintaining proper clamping load and load distribution. Wire ring-style gaskets require the high- est clamp load and can feature high peak loading along the cylinder openings. Again, by contrast, all active (spring function) MLS gaskets have the lowest peak loading along the cylinder openings. MLS gaskets with a built-in "stopper" layer or beaded spacer provide high com- bustion sealing stress with lower required bolt loading. Active MLS gaskets are designed with formed metal layers featur- ing contact and air spaces that work as a spring to provide compressive tension that aids in sealing while requiring lower load- ing. Active MLS gaskets feature an elastic element that absorbs cylinder head motion. Stopper MLS gaskets also feature a layer of "dead stop" that provides a limit to com- pression. Stopper-type gaskets feature rigid combustion seals, which bend the cylinder head over the seal as a result of clamping loads. Active MLS offers low hardware distor- tion, since the gasket "gives" to reduce the chance of distorting bores and head decks. This type also provides good recovery for lightweight hardware. However, it may be difficult to gener- ate high combustion sealing stress with an active type MLS. The stopper MLS type of gasket provides high sealing potential, but has the potential to generate high hard- ware distortion. 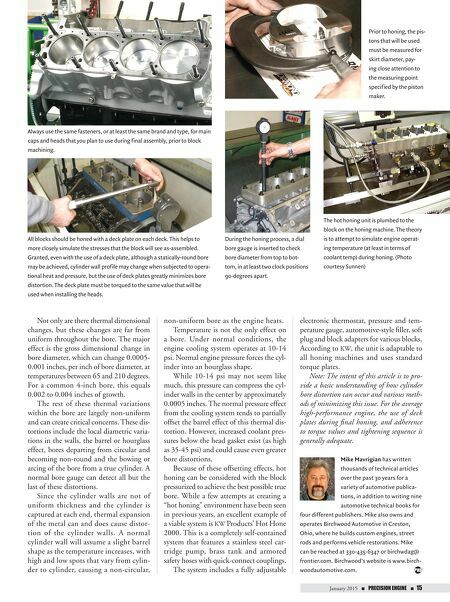 Determining which type of gasket to use will be based on research data gathered during engine component selection, engine test assembly and engine operation (on dyno and/or on-track). 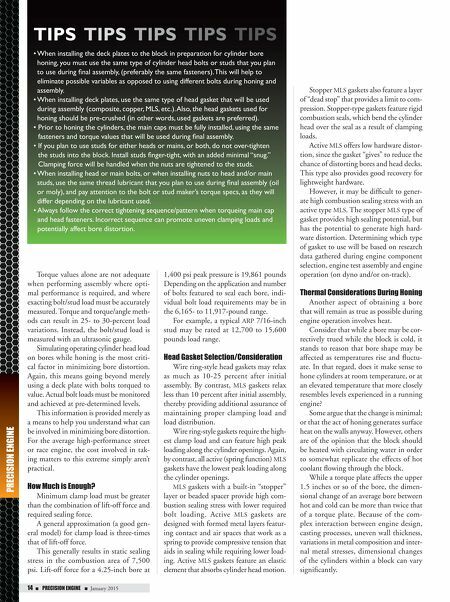 Thermal Considerations During Honing Another aspect of obtaining a bore that will remain as true as possible during engine operation involves heat. Consider that while a bore may be cor- rectively trued while the block is cold, it stands to reason that bore shape may be affected as temperatures rise and fluctu- ate. In that regard, does it make sense to hone cylinders at room temperature, or at an elevated temperature that more closely resembles levels experienced in a running engine? Some argue that the change is minimal; or that the act of honing generates surface heat on the walls anyway. However, others are of the opinion that the block should be heated with circulating water in order to somewhat replicate the effects of hot coolant flowing through the block. While a torque plate affects the upper 1.5 inches or so of the bore, the dimen- sional change of an average bore between hot and cold can be more than twice that of a torque plate. Because of the com- plex interaction between engine design, casting processes, uneven wall thickness, variations in metal composition and inter- nal metal stresses, dimensional changes of the cylinders within a block can vary significantly. Tips Tips Tips Tips Tips • When installing the deck plates to the block in preparation for cylinder bore honing, you must use the same type of cylinder head bolts or studs that you plan to use during final assembly, (preferably the same fasteners). This will help to eliminate possible variables as opposed to using different bolts during honing and assembly. • When installing deck plates, use the same type of head gasket that will be used during assembly (composite, copper, MLS, etc.). Also, the head gaskets used for honing should be pre-crushed (in other words, used gaskets are preferred). • Prior to honing the cylinders, the main caps must be fully installed, using the same fasteners and torque values that will be used during final assembly. • If you plan to use studs for either heads or mains, or both, do not over-tighten the studs into the block. Install studs finger-tight, with an added minimal "snug." Clamping force will be handled when the nuts are tightened to the studs. • When installing head or main bolts, or when installing nuts to head and/or main studs, use the same thread lubricant that you plan to use during final assembly (oil or moly), and pay attention to the bolt or stud maker's torque specs, as they will differ depending on the lubricant used. • Always follow the correct tightening sequence/pattern when torqueing main cap and head fasteners. Incorrect sequence can promote uneven clamping loads and potentially affect bore distortion.